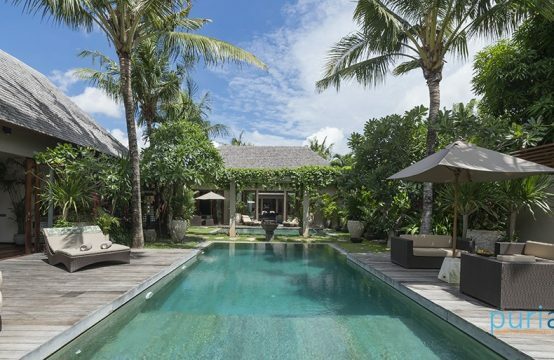 Villa Jajaliluna is a hidden paradise within the vibrant and upmarket neighbourhood of Seminyak, on Bali’s south-west coast. 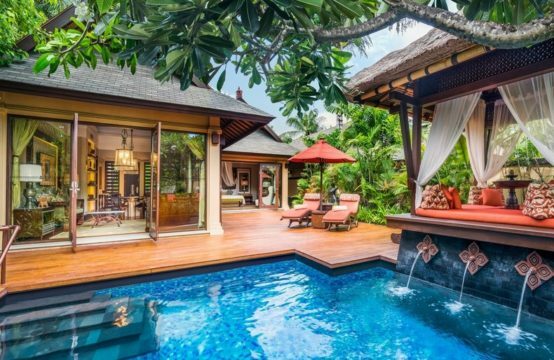 This four-bedroom villa is the ultimate location for those wanting to be close to the action but also seeking a quiet place to chill out and relax. Luminous with a white facade, French-style shutters, terrazzo tiles, Palimanan stone surrounds and bengkirai wood floors, the villa combines modern and colonial architecture to create a tropical oasis. Built around a dazzling T-shaped swimming pool, the villa is practical and compact but offers plenty of space with three separate living areas, an open-plan kitchen and dining room, pool deck, outdoor dining terrace and four air-conditioned bedrooms with large ensuite bathrooms. The location of Villa Jajaliluna just 500 metres from Seminyak Beach which is wide black sandy beach near the villa stretches north and south as far as the eye can see and a short stroll to the island’s most famous restaurants, bars, spas and boutiques, Jajaliluna Villa is a food lover and shopper’s dream location. Guests enter the Villa Jajaliluna via a Palimanan stone walkway bordered by high walls and hibiscus which leads to a large wooden cantilevered door and a compact garden courtyard. Stepping stones traverse a pond flanked either side by fire bowls and a small lawn planted with coconut trees, to present a central T-shaped swimming pool and Jajaliluna’s three living pavilions. Closest to the entrance lies the open-plan living/kitchen pavilion which overlooks the pool deck. Symmetrically opposite is the media room and outdoor dining terrace. The main two-storey pavilion, comprising four bedrooms and two living areas, languishes along the far side of the pool, facing west to maximise the sunset views. Housed in the main two-storey pavilion with it’s traditional wood-shingled roof, whitewashed walls, ironwood floors and white French shutters, all four light and airy bedrooms are cooled by air-conditioners and ceiling fans and open onto – or overlook – the swimming pool. From its poolside position on the ground floor, the stunning master suite features a king-size bed draped with mosquito netting and is beautifully decorated with bright green, yellow and pink cushions that contrast beautifully against crisp white linens. A frosted glass door slides open to reveal a huge ensuite bathroom with a walk-in rain shower, twin marble vanities and a walled garden that boasts a second rain shower and a large terrazzo bathtub for starlit bathing. The two king-bedded guest rooms (one on the ground floor and the other directly above) are similar in design and accented with pink and green fabric which injects splashes of colour against the whitewashed walls. Opening onto the pool deck, the ground floor room features a mosaic-tiled ensuite bathroom with a small walled garden, a bathtub and an open-air shower. The upstairs guestroom, which opens onto a balcony overlooking the pool, is furnished with a super-king-size bed and a white-upholstered leather armchair. The ensuite bathroom features a walk-in rain shower and grey marble vanity which opens onto a balcony at the rear. The fourth bedroom is also located on the upper floor; accessed from the TV lounge. With mezzanine-style bunks above twin beds, this room is ideal for four children, but is also suitable for two adults and two children. The ensuite bathroom is fitted with a walk-in rain shower and grey marble vanity opening onto a rear balcony. Jajaliluna’s two-storey pavilion features two living areas where guests can unwind and relax. The downstairs lounge opens widely onto a timber deck bordering the pool but can be closed off in inclement weather. With cool terrazzo floors, ceiling fan, rattan sofa and comfortable arm chairs, this is the perfect place to sit back and enjoy your favourite music on the Denon sound system. To the rear of the lounge is a small walled garden with a cascading water-wall that creates a soothing ambiance. A Palimanan stone staircase with glass balustrade leads to the mezzanine TV lounge. Equipped with an L-shaped white leather sofa, beanbags, ceiling fan, a large flat-screen satellite TV, DVD player and Nintendo Wii, this makes a great space for the kids to hang out. This room also opens onto the balcony overlooking the pool. The villa’s media room is housed in a single-storey poolside pavilion, characterised by an ironwood floor and vaulted roof. Bi-fold doors on three sides can be opened to enjoy the natural breeze or closed for air-conditioned comfort. Equipped with a 42-inch satellite TV, DVD player, Denon surround-sound system and movie box, this is the spot to enjoy a film while relaxing on the deep-cushioned sofas. One wall is fitted with bamboo cupboards and shelves stocked with books and artefacts, while twin alcoves showcase white Buddha-head statues resting on pedestals. Opposite the media room, across the pool, lies the open-plan kitchen/dining pavilion. The predominately white kitchen is fitted with a stainless steel oven and stove, wok burner, large fridge, coffee machine and microwave, and features a teak bar with six bar stools where guests can sit and sip cocktails while the chef prepares dinner. This pavilion also offers a choice of fan-cooled tropical living or enclosed air-conditioned comfort. The dining area is furnished with a fabulous square dining table (seats eight) and opens out onto the poolside deck. One wall features numerous artefacts, a cigar box (stocked for guest enjoyment) and a blue and white painted boat named ‘Jajaliluna’. The dazzling T-shaped swimming pool with cool aquamarine and cobalt blue ceramic tiles forms the focal point of the villa and is fitted with recessed lights to create a lovely night-time ambiance. Four separate poolside areas cater for different moods: for sun seekers, the Palimanan stone sun terrace is furnished with loungers and umbrellas; for reading or socialising, a timber deck is shaded by sails and furnished with two round rattan sofas; for outdoor dining, the white washed teak dining table and barbecue await, and for those that wish to doze there’s a sheltered daybed, guarded by two Thai statues. The well-kept garden courtyard features bougainvillea, frangipani trees, coconut palms, native ginger and a small lawn. An outdoor shower is convenient for rinsing off after a swim in the pool or a trip to the beach. 8 adults, 2 children (4 bedrooms: 3 with king-sized beds and 1 with twin beds which can be converted to a king plus 2 bunk beds for children). Open living/dining pavilion; media room; living room; upstairs lounge. Villa manager; chef; junior cook; butlers; villa attendants; pool attendant/handyman; security guards. Masseuse and babysitter on request. WiFi internet access; landline for local calls and IDD; mobile phone coverage. Satellite TV and DVD players; Denon surround-sound system with CD player; iPod dock, movie hard drive; Nintendo Wii. 1 high chair; baby cot; baby car seat; bottle steriliser; DVDs; games. Safes, barbecue, backup generator, Complimentary Canggu Club access (up to 4 guests).